Some 30 experts from 12 CITES Parties met in Dar es Salaam from 7 to 15 March 2019 at the CITES Tree Species Programme Regional Meeting for Africa hosted by the CITES Management Authority of the United Republic of Tanzania. The CITES Secretariat, with support of the International Tropical Timber Organization (ITTO), organized the meeting through the CITES Tree Species Programme. The CITES Tree Species Programme (CTSP), funded by the European Union, with additional funding from the United States of America, aims to ensure the sustainable management of rare tree species and their products and to contribute to legal, traceable and fair trade in products from CITES-listed tree species. The Programme is also working to help strengthen forest governance, forest management policy, enforcement capacity and ensure long-term benefits for sustainable economic growth at country level through a healthy private sector and long-term poverty alleviation. During the meeting, participants learnt about the CITES Tree Species Programme and the work done in Africa with a focus on the trade routes and patterns in the region. 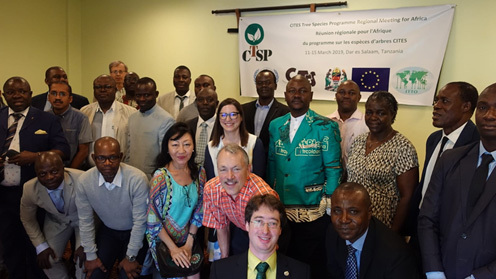 Benin, Burundi, Cameroon, Côte d’Ivoire, Gabon, Kenya, Madagascar, Nigeria, the Democratic Republic of the Congo, Togo, Uganda and the United Republic of Tanzania explained how they will be implementing their respective projects funded under the CTSP. On 12 and 13 March, participants split into two working groups dedicated to specific discussions on Prunus africana (African cherry) and Osyris lanceolata (African sandalwood). Range States of the African cherry shared their perspectives and considered recommendations on methodologies for inventories, sustainable harvesting techniques, monitoring and traceability, plantations and agroforestry with the aim of improving the future management of the species. Participants also learned about livelihoods and the sustainable management of the African cherry through an overview of available experiences in this area. The working group on Osyris lanceolata focused on the knowledge gaps with respect to the management of the species. 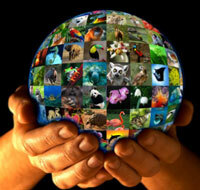 While the distribution of species is mostly understood, the population level is little known, and much work is required to sustainably manage the species. There remains an urgent need to develop data on populations, regeneration and host species because of its semi-parasitic ecology and the volumes of wood in illegal trade. Participants agreed that DNA level technology was needed to distinguish from look-alike species and for within species variation; that distribution maps should be updated; and that additional research was needed to improve the ecological understanding of the species, including its role in ecosystems. On the last two days, participants agreed that future work should focus on non-detriment findings; marking and traceability; tree species product identification; and capacity-building and governance. “The CITES Tree Species Programme Regional Meeting for Africa has proved to be a unique and invaluable opportunity to strengthen regional cooperation among CITES authorities across African States that do not often have the opportunity to combine efforts towards implementing CITES for tree species. This meeting also provided an opportunity for CITES Parties in Africa to coordinate work in preparation for the 18th meeting of the CITES Conference of the Parties. We are most grateful for the support of ITTO as well as funding from the European Union and the United States of America that have made this possible”, said CITES Secretary-General, Ivonne Higuero. This meeting was the third of its kind, after similar regional meetings organized to support the work by the Parties in Asia and Central and South America and the Caribbean. African colleagues agreed that it would be valuable to replicate this experience in the future and encouraged the CTSP team to seek options to organize another regional meeting before the end of the implementation of the projects with the aim to evaluate progress and implement corrective actions as needed.